The Carol Pufahl Literacy Foundation, a 501(c)(3) nonprofit organization, is the local champion of Dolly Parton’s Imagination Library. We are offering the opportunity to sponsor a one year gift to a child of your choice who is under the age of five and living in the U.S. but outside of our designated participation area. With your gift you can be a part of this extraordinary literacy program that has an impressive track record of contribut­ing to meaningful parent/child interactions through a read aloud program. Each child enrolled in the program will receive an age-appropriate book each month of the year he/she is enrolled, building the child’s own home library. This gift of books is renewable each year until the child reaches age 5. Enrollment in the Imagination Library through The Carol Pufahl Literacy Foundation also makes a great Holiday or birthday gift for your child, grandchild, niece, nephew, or even your child’s preschool classmates! Imagine that special child receiving a gift that arrives by mail, addressed to the child, every month for one year and renewable until the child reaches the age of five. Beyond that, this gift lays the foundation for a lifelong love of books and reading. Every month your designated child will receive a new, age appropriate book, with the potential to receive up to 60 books should you wish to renew yearly. 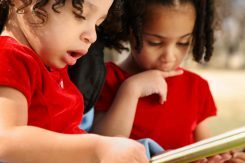 A national committee of childhood education experts selects the books for the Imagination Library, which has included such well-loved classics as The Little Engine That Could, Spot Goes to the Farm, Snowy Day, The Very Hungry Caterpillar, and Llama Llama Red Pajama. The committee also determines an age-appropriate timeline for book themes, including: visual and playful stimulation in year one; repetition and body awareness in year two; love, colors and letters in year three, diversity of others and poetry in year four; and finally riddles, science and appreciation in year five. New titles are introduced each year so younger siblings may not receive the exact same books as their older siblings. Give a child you know the gift of reading for only $35 for one year. Gift sponsorship includes a complimentary Holiday or birthday card sent to the recipient to notify them of their gift.